If you want your videos to look and feel more professional, you’re in the right place. You might be thinking that to increase the quality of your videos, you need a better camera. Right? There are some great reasons to buy a better camera. But the reality is when you improve the lighting (and the sound) in your videos, you can see some pretty amazing results even when you’re recording with your smartphone. Now let’s setup your paper lantern lighting. Position your paper lantern just above your camera, just above your eye line. This will create beautiful shots of you when you’re talking to a camera in a more controlled environment like your workspace. Stand in front of the camera. Talk to it for maybe 15 seconds. And play back the video clip to see what you think of your lighting. If you like the way the lighting looks, then go with it and record your video. But if it’s not quite there yet, adjust the position of your light and repeat recording a test clip until you like what you see in your lighting. Why am I sharing this lighting technique in particular? Soft lighting is one of the most flattering for people’s faces. 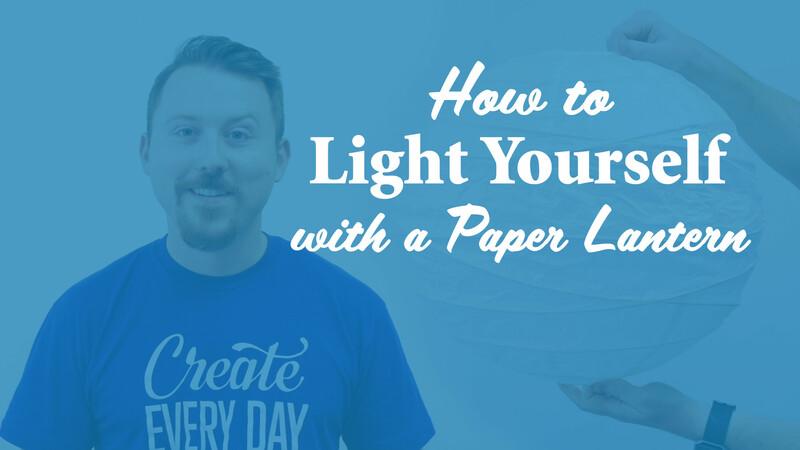 And a white paper lantern is a wonderfully simple tool for you to use to light yourself beautifully. Plus – it’s a great, affordable upgrade to your lighting setup too. Your turn – how are you lighting your videos? Let me know in the comments. Love to hear about it.